Ar lan y môr* is a self contained, elevated two bedroom cottage with an open plan kitchen, dining and lounge area, plus bathroom, toilet, laundry and two decks. Ar lan y môr is ideal for one or two couples or two friends requiring separate bedrooms. It has not been set up to cater for children. Moana View is a comfortable elevated 3 bedroom house on two levels, set well back from a quiet street. Rumah Kita*, a solidly built spacious family holiday home on the waterfront – perfect for an extended stay in any season. Its upper and lower levels allow for privacy, making it suitable for parents and two children travelling with say grand parents. Waterline is an elevated and spacious 3 bedroom family home right above the waterfront and immediately above Sheoaks. Waterline is perfect for a family with up to 4 children or for two couples. 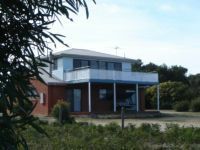 Currawong is a spacious double A frame 3 bedroom holiday house on a large corner block. A well grown hedge provides privacy. Secure gates make the yard safe for small children and there’s enough room to play cricket or toss a frisbee. Bedrooms (each with their own balconies) are upstairs, as is the bathroom. 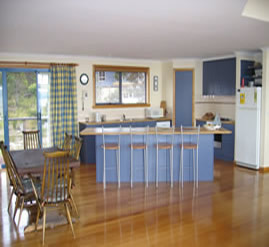 Downstairs you will find a well equipped kitchen and a large comfortable lounge/ dining room. The laundry and a second toilet are off the back porch. A very large car port provides plenty of room to park a car and a boat. A gas barbecue and outdoor sitting areas are popular in summer. 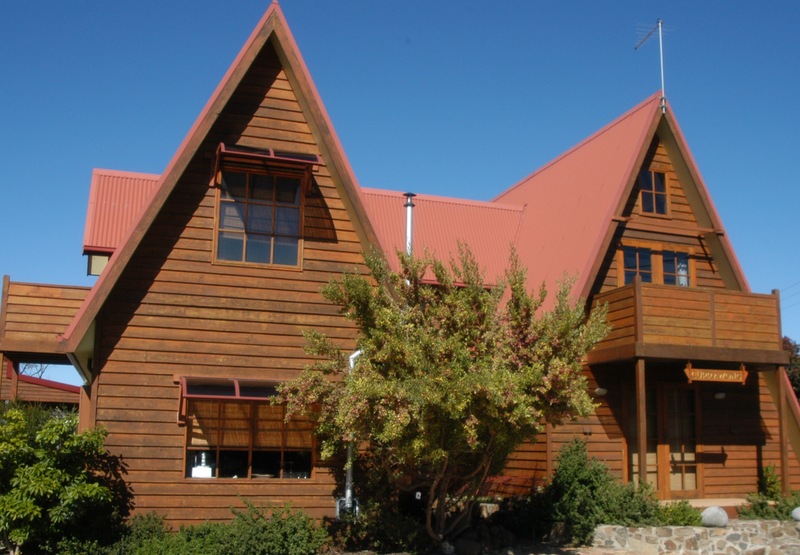 The house is ideal for 3 couples or a family with up to 4 children. Price displayed is per double. Price/night for each additional person is $20 payable on departure. The house sleeps up to 6 in one queen bed and two double beds. Price for two people in separate rooms is $170/night. Bedroom with pillow topped king sized bed,with views to the estuary of the Swan River, en-suite facilities, individually controlled electric heating, electric blankets, hair dryers and a stack of books to read. Décor - a pleasant mix of ultra modern with restored cottage furniture. Full cooked breakfast featuring great Tasmanian produce. Ar lan y môr is an elevated two bedroom cottage with an open plan kitchen, dining and lounge area, plus bathroom, toilet, laundry and two decks. 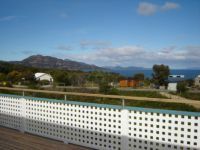 The front deck, main living area and front bedroom have superb views of the Freycinet Peninsula, Schouten and Maria Islands and Great Oyster Bay. 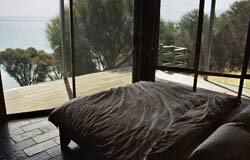 The second bedroom and back deck look out over Great Oyster Bay. It’s a gentle 10 minute walk down Oyster Bay Court and the waterfront track to Swanwick Beach. Ar lan y môr is ideal for one or two couples or two friends requiring separate bedrooms. It has not been set up to cater for children. Pricing is per couple with additional charge of $20 per person per night payable on departure. 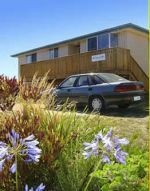 Two singles using separate bedrooms - $170/night. Bedroom with pillow topped twin king sized beds,with views to the estuary of the Swan River, en-suite facilities, individually controlled electric heating, electric blankets, hair dryers and a stack of books to read. Décor - a pleasant mix of ultra modern with restored cottage furniture. Full cooked breakfast featuring great Tasmanian produce. Rumah Kita, a solidly built spacious family holiday home on the waterfront – perfect for an extended stay in any season. Its upper and lower levels allow for privacy, making it suitable for parents and two children travelling with another couple,say grand parents. Price displayed is per double. Each additional person is $30/night. The house will accommodate 6 in 2 queen beds and two single beds. Any additional payments due on checkout. Moana View is a comfortable elevated 3 bedroom house on two levels, set well back from a quiet street. The top level has wonderful views south across Black Point, Great Oyster Bay, the Hazards, Mounts Graham and Freycinet, with Schouten and Maria Islands beyond. Our safe local beach is a gentle 10 minute walk along Oyster Bay Court and the waterfront track. Moana View is suitable for two couples travelling together or for a couple with up to 4 children. Price displayed is per double. Price/night for each additional person is $20. The house sleeps up to 6 in two queen beds and two single beds. Price for two people in separate rooms is $170/night. Bedroom with pillow topped queen sized bed,with views to the estuary of the Swan River, en-suite facilities, individually controlled electric heating, electric blankets, hair dryers and a stack of books to read. Décor - a pleasant mix of ultra modern with restored cottage furniture. Full cooked breakfast featuring great Tasmanian produce. 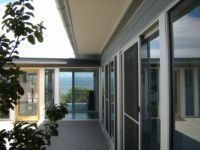 Waterline is an elevated and spacious 3 bedroom family home right above the waterfront and immediately above Sheoaks. 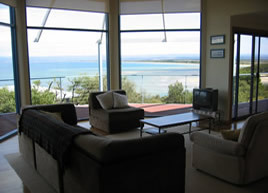 All the main rooms have stunning views out over Great Oyster Bay, the estuary of the Swan River and Nine Mile Beach. Our local beach is only a 5 minute walk away down the waterfront track. Waterline is perfect for a family with up to 4 children or for two couples. Price displayed is per double. Price/night for each additional person is $20. Price for 2 people using separate rooms $190/night. Additional payments due at checkout. 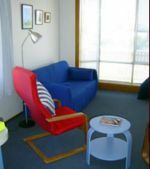 Bedroom with pillow topped bed,with views to the estuary of the Swan River, en-suite facilities, individually controlled electric heating, electric blankets, hair dryers and a stack of books to read. Décor - a pleasant mix of ultra modern with restored cottage furniture. Full cooked breakfast featuring great Tasmanian produce. Beachcomber is an elevated two bedroom beach house with an open plan kitchen, dining and lounge area, plus bathroom/toilet and laundry. 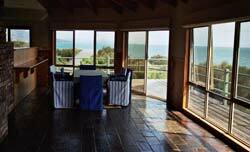 The deck and main living area have superb views over a clump of sheoaks to Great Oyster Bay and the ranges beyond. It’s a 5 minute walk down Oyster Bay Court and the waterfront track to Swanwick Beach. Beachcomber is ideal for one or two couples, two friends requiring separate bedrooms or a couple with up to three children. Price displayed is per double. Price/night for each additional person is $20. 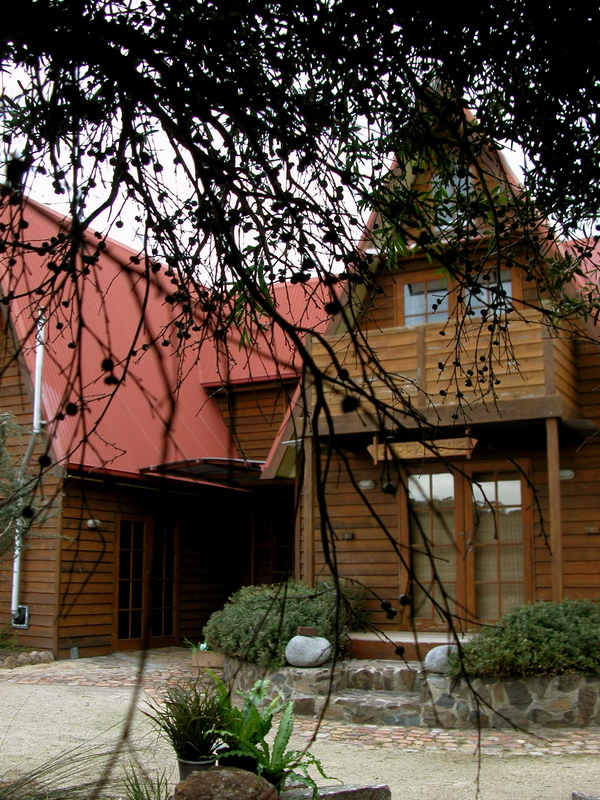 The house sleeps up to 5 people.